I've spent the better part of two weeks barreling down the highway to the sandy coast of this great state. But when the headlights are the only glow on the pitch black path, you find yourself pondering. Our journey has us traveling Hwy. 22 most mornings at 4:45am. I've come to realize in the to and fro that this is a road less traveled. Not many set out on this path. 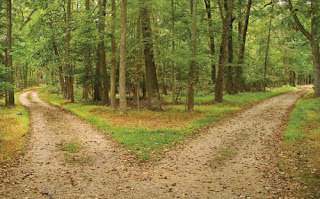 Which path do I take most in my life? The one that is well worn and wide. The one that is adorned with inviting places to stop. The one that is crowded and busy; full of distractions and doubt. The one that is dark and almost-new. The one that is hard to find in the hours before the break of light. The one adorned with trees and shrubs and landscape that shout His praises. The one that often is lonely and unsure. The one that is quiet and peaceful. Which path do I take most? Disappointingly, I'd have to say the later. In most situations, on any given day, I don't blaze a trail that proclaims the Gospel. All the distractions and doubt bog me down, keeping me on cruise control. Stuck in a rut. The Beauties have been diving into Radical by David Platt the past three weeks. And let me tell you, I'm digging deep and searching my heart for radical ways I can follow Christ. Because the truth of the matter is Christians should be radical. We should look different from everyone else. We should take the road less traveled. 'You can enter God's Kingdom only through the narrow gate. So, which path do you most often take? What is one way you can be radical for Christ this week? I'm searching my heart for answers, too. I'd love to hear what the Holy Spirit reveals to you.